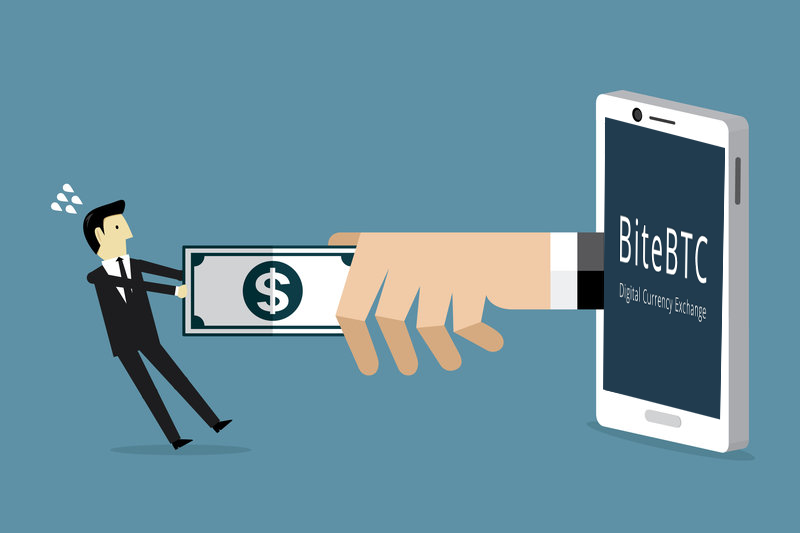 Cryptocurrency exchange BiteBTC Allegedly termed as SCAM exchange, found creating trouble for the users of the platform. In a recent move, the official Twitter account of the exchange announced as maintenance associated with the transition to the new data center, while many criticisms were made by suspicious users. The site was inaccessible for days, It became difficult to connect to the site from this month and the service was virtually suspended. And this situation continues for two days. Truth be told, Bitebtc has continued to create a troublesome atmosphere following the incident that lost customer information during a fire. While whoever is familiar with the industry will agree that when an exchange presents unverifiable claims, it indicates that something fishy is going on there. The data center fire claim has stirred many of its customers. The exchange mentioned the destruction of 7% of its balance sheet. Things are happening and it would not have been unusual if the exchange had not been under surveillance for fraudulent acts. After the incident, many customers users found having trouble accessing their accounts and their Funds. A scared user wrote to a prominent media that he had lost two bitcoins and had never been so sad. The user added that he could not log in to the website or access his account. He then added that the How To Singapore exchange can shut down, steal $ 67 million and then disappear. He also stated that he had completed a form on the Contact Us page of the exchange after learning of the incident. The official twitter of Bitebtc was overflowing with such tweets by numerous customers and there was no reply by BiteBTC has been made in response to users claim. Many users claim that they had yet not heard from the exchange and he doesn’t think he will hear anything in the future. In the light of these incidents, CoinMarketCap has updated its page on BiteBTC with a message that they have received information that user deposits are being held. And also asked users to pay attention to their funds. A BiteBTC claim group is created by the users of the platform for those who had lost their funds in BiteBTC can claim. The members of the group had shared the problems they are facing in trading, withdrawal and account access. People were found very upset over losing their hard-earned money, and are finding ways to get their funds back putting collective pressure on the exchange. Conclusion – BiteBTC can provide their customers with proper support, help them accessing their assets/funds (which they claim to be inaccessible), among other related responses. They don’t do anything like that, even though they didn’t bother to reply on their official twitter where people are questioning them. 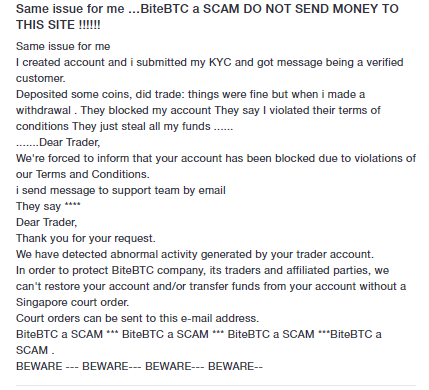 This can all be somewhat legitimate but currently, it doesn’t smell like that and BiteBTC certainly doesn’t provide an answer that will free them or answers to claims of hundreds/thousands of customers and traders who had lost their funds on BiteBTC.